I created this card for SCS SC194. Here I used one of the witch images from Starving Artistamps Witch Trio with the Marker Watecoloring tech from the TJNL. Have I mentioned how much I like this technique! The white paper with black bats is a FREE Digi Paper you can download from Becky's Blog. Don't forget if you plan on attending the RubberStamp Expo in St. Charles - stop by and see me - I'll be at the Artistic Outpost booth. I'll also be teaching a Distressed Ruler Class at the Expo with Artistic Outpost Design Team member Gerrie Johnnic. I love this card and I love this stamp set. The sentiment just cracks me up. I love your use of colors and DP. TFS. Hi Lisa! I found your blog through looking at the Artistic Outpost blog (and following links) that I learned about at the Rubber Stamp Expo today. We visited your booth early, spent lots of money and I LOVE everything I got from your booth. I even blogged about visiting there! Anyway- I noticed where you live- I live in Matteson. Small world. 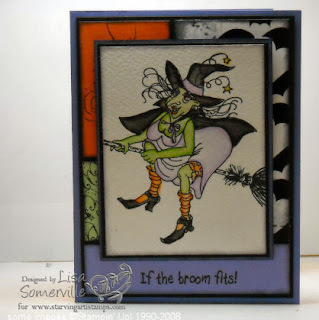 Your blog is great and I plan on visitng often...I love the witch card you made. Hope you had a great weekend! Again- LOVED your booth! This is SO funny! I am lovin' these withes!